Alex Lees and Gareth Harte scored half centuries but Durham, set an improbable 361 to win the game, collapsed from 177 for 4 to 235 all out. Critchley took 3 for 54 including two wickets in two balls and van Beek followed a stunning catch to remove Jack Burnham for 32 by bowling Harte for 69 and then removing Stuart Poynter in his next over. Ravi Rampaul also took two wickets and after the second new ball sealed Durham’s fate, there were just over 18 overs remaining when Luis Reece clinched a 19 point victory. 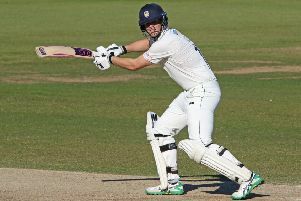 Durham’s chances of saving the match looked good after Lees and Harte batted through most of a sunny morning before Critchley struck twice in consecutive balls. There had been few alarms for the openers on a pitch which had flattened out but after Lees swung Critchley’s first ball for six, he edged the third to short leg and the next had Will Smith taken at slip. Alex Hughes just failed to take what would have been a brilliant one handed catch at second slip when Michael Richardson edged a drive at Critchley before he had scored. Richardson could do nothing with one from Rampaul that kept low and bowled him five overs after lunch but Harte and Jack Burnham played with increasing authority to suggest Durham might be in with a chance of chasing down the 361 target. But the game turned back towards Derbyshire as both were dismissed in the space of six balls after adding 57 in 17 overs. Burnham tried to whip Wayne Madsen through mid-wicket but van Beek plunged to his left to take a breathtaking catch and in the next over he brought one back to end Harte’s 258 minute occupation. Poynter was caught behind in van Beek’s next over and the rest of the innings fell away rapidly with the lower order offering little resistance. Ben Raine drove back a return catch to Critchley, James Weighell was run out by a direct hit from mid off and Matt Salisbury edged Rampaul to first slip. 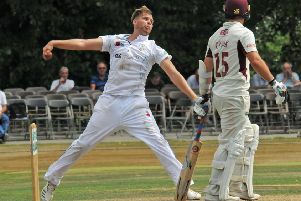 Liam Trevaskis and Chris Rushworth delayed Derbyshire’s celebrations but the inevitable was confirmed when Reece swung what was the last ball before the delayed tea interval in to trap Rushworth lbw.